The JEOL JSM 5410 LVSEM is a versatile microscope with 3 attached detectors: a secondary electron detector for imaging and topography, a back-scattered electron detector giving compositional information and an X-ray detector for elemental analysis. The spacious specimen chamber enables examination of single large samples up to 150mm diameter with 125mm diameter viewable or several smaller samples (up to 8) in various multi-holders. The eucentric goniometer stage offers high accuracy and vibration resistance with tilt from -10 to +90? and continuous dynamic focus. In high vacuum mode the resolution is 4nm whilst in variable pressure mode the resolution remains a decent 5.5nm. There are several automated functions including focus, contrast and brightness settings, astigmatism correction, photo acquisition and a low vacuum mode. There are four sets of frame memories so that up to four separate images that can differ in magnification, detector type, accelerating voltage, etc, can be compared on one screen with a high resolution digital image capture facility which includes some measuring and image analysis functions. The Main Unique Aspects Of The Machine Specimen observation and analysis are possible without pre-treatment or coating. This is facilitated by operation in a low pressure environment and backscatteredelectron acquisition The change from high vacuum to variable pressure mode is by a single button and it can be operated in an auto mode or by manual pressure setting. The low vacuum range is from 6-270Pa. There is a motorised stage which operates in the x, y and rotation axes and can be programmed, all movements being monitored by an infra-red chamberscope displayed on an additional TV screen. 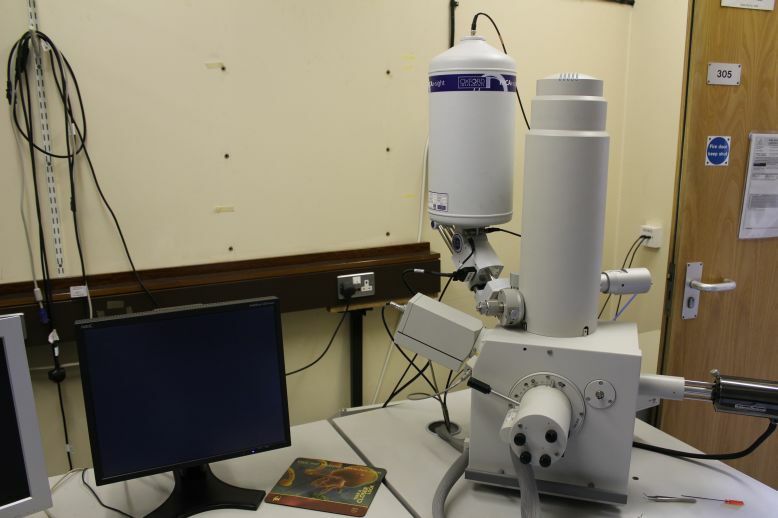 An Oxford Instruments INCA EDX system is attached to the SEM and elemental analysis can be carried out in both high vacuum and variable pressure modes. The system allows the analysis of large or small areas, points and lines and also the localisation of individual elements can be mapped.